Rob Gronkowski apparently forgot what sport he was playing late in New England’s game against Buffalo. 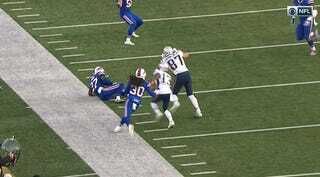 After an interception from Tre’Davious White, Gronkowski ran up and, for no particular reason, decided to plow his elbow into the back of White’s helmet while the defender was still on the ground. He got a personal foul for his NFL Blitz-level shot, but somehow stayed in the game. White, however, left and was evaluated for a head injury. You’re in Buffalo, Gronk. Save the wrestling moves for a cheap table.